If Black simply cuts at , he has an eye. I see no way to avoid seki. 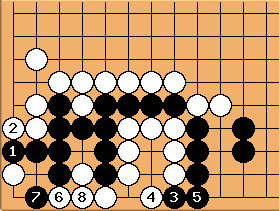 Black has to spoil White's shape. White cuts at , producing a ko. Black winning the ko. Playing is better than playing at a. 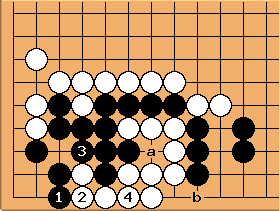 Black has an eye in the corner accounting for three liberties. The inside liberty at a and the false eye are two more liberties. White has one outside liberty and an approach move liberty at b. Black is far ahead in the fight: I believe he can omit . If White cuts, Black captures. prevents the connection underneath at a. at . again prevents the connection underneath at a. wins the fight. 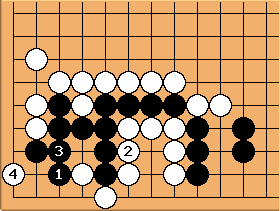 If Black attempts to do better than the ko in the main line, he will end up worse. If Black wants to do better, looks like the only possibility. 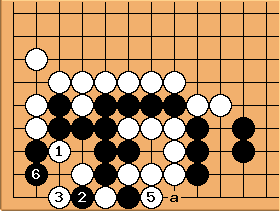 White makes an eye with and threatens to capture the black group in a snapback. thus is forced. 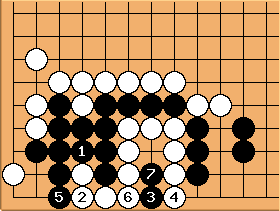 White's placement at is tesuji. 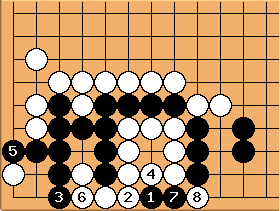 If Black makes a counterplacement, must connect on the inside (see further comments). is a first possibility. and both make an eye. and prevent the second eye. After Black throws in at , White has one eye liberty and three outside liberties (a, the marked stone and b). Black has two eye liberties (see big eyes can be small in the corner) and one outside liberty. In this eye versus eye capturing race with two small eyes, White is alive. Black counts the inside liberty to defend but the number of liberties is then the same and White has sente. White kills. Another way for White to win the capturing race is here. For one thing, Black must be very careful not to make an eye at a: see eyes that lose liberties example 1. 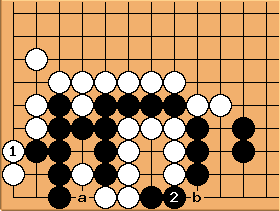 But even if Black cunningly starts taking away outside liberties with , White has three outside liberties left, the approach move at b included. She will eventually play a to atari Black. 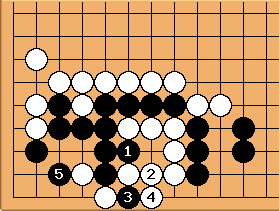 If Black cuts off the placement with , White still makes her eye at . If Black a, White b reverts to the counterplacement main line. In the game, was a big mistake but so was . The next diagram explains how White should have won the capturing race after . 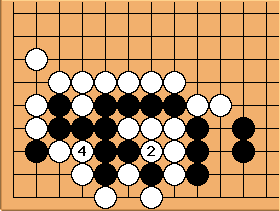 After connecting here, White has four liberties (including an approach move) against Black's three. This way it is two against three again. When fighting a semeai, mutual liberties should be taken last. Black had to cut off , get one eye, and then attack from the outside only. Then he gets an easy seki. 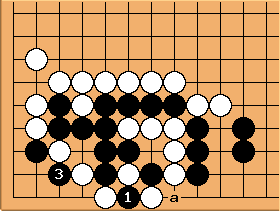 Of course, it the game Black got more, but that was only because White could not count liberties. 4. Takeback wins a tempo. 5. Attack from the outside; mutual liberties have to be filled last.